NASA successfully tested on Thursday an escape system for astronauts that may be used on the next generation of shuttle spacecraft. The unpiloted Max Launch Abort System (MLAS) lifted off from a launch facility here just after sunrise and soared about a mile into the atmosphere before a mockup crew capsule separated from its bullet-shaped enclosure and parachuted safely to the ground. The MLAS is being considered as an alternative means for astronauts to escape should trouble develop during or shortly after launch. 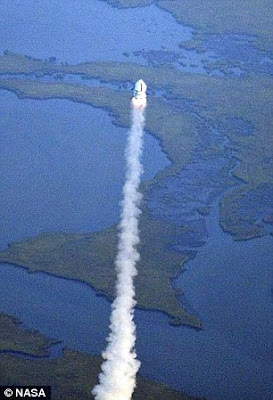 It would eliminate the need for an escape launch tower, such as that used during the Apollo program, as well as attitude control engines. The system is composed of four parts: a bullet-like fairing with four fins, the crew capsule, a motor cage, and "coast skirt" connecting the motor cage to the fairing. 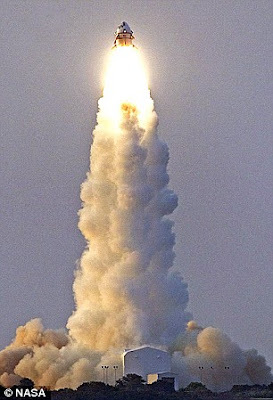 Weighing more than 46,000 pounds and more than 33 feet tall, the MLAS would sit atop an Ares I rocket. 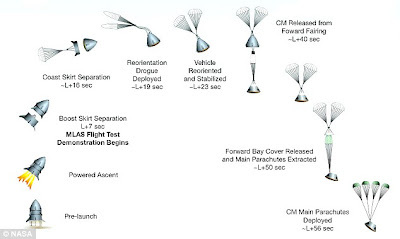 Should a problem occur during the early moments of launch, the motor of the MLAS would turn on, carrying the crew away from the rocket. The sections will separate and float to safety at the end of parachutes. MLAS is not expected to replace an escape system already developed for Orion spacecraft, which will replace the space shuttle by 2012 as a means of traveling to the International Space Station and the moon.